Purpose: Epidural steroid injection is a commonly used low risky symptomatic treatment option of lumbar radiculopathy in patients with poor response to conservative management. The purpose of this prospective study was to compare the efficacy of transforaminal and interlaminar epidural steroid injection. Materials and Methods: In this study computed tomography guided lumbar epidural steroid injections were performed in 87 patients, steroid injections were made by transforaminal and interlaminar technique. The effectiveness of this treatment was evaluated by visual analogue scale at 2 weeks (acute), 3 months (sub-acute) and 6 months (chronic) after the injection. Results: In interlaminar group 78.1% patients had effective pain relief at acute term and 73.4% patients had effective pain relief at sub-acute and chronic term. In transforaminal group 82.6% patients had effective pain relief at acute term and 73.9% patients had effective pain relief at sub-acute and chronic term. Transforaminal group showed slightly better pain relief in all terms but the difference was not statistically significant. Patients with symptom duration more than 6 months had statistically significant higher pain relief than the patients with symptom duration less than 6 months in acute term but there was no statistically significant difference between sub-acute and chronic terms. Conclusion: In the current study transforaminal epidural steroid injections for the treatment of lumbar radiculopathy resulted in better pain relief than interlaminar epidural steroid injections in all terms but the difference was not statistically significant. Low back pain and concomitant radicular symptoms is the most common chronic pain problem [1,2]. Lumbar intervertebral disc herniation and spinal stenosis are the two most common causes of lumbar radiculopathy which leads serious restriction in the social lives of more than half of the patients . Epidural steroid injection is commonly used, minimally invasive, effective, low risky sympthomatic treatment option of lumbar radiculopathy; in patients with poor response to conservative management before the surgical procedure [2-6]. The first epidural injection was made by Sicard in 1901 by caudal cocaine injection . Epidural steroid injections have been used from 1952 for the treatment of lumbar radicular pain [8-10]. Injections could be made blindly or under either fluoroscopy or Computed Tomography (CT) guidance. Blindly performed injections, using interlaminar loss of resistance technique has 13-30% incidence of improper localization of the space [10,11]. Although it is a cheap and rapid technique dural puncture, post dural puncture headaches, epidural hematoma, spinal cord injury, intravasculary injection are the potential complications . Epidural steroid injection using imaging techniques could verify the needle placement by contrast injection. Fluoroscopy guided epidural injection allows taking simultaneous images but it is hard to find epidural space by fluoroscopy in patients with scoliosis, large osteophytes or disc space narrowing . CT which has higher spatial resolution shows anatomic details and the accurate localization of the needle superior to fluoroscopy. The complication rate is much rarer. A common concern is that CT may be associated with higher radiation doses compared with fluoroscopy. Schmid et al. compared the radiation dose of CT guided and fluoroscopy guided lumbar spinal injections and found the effective dose to be similar for both modalities . CT guided steroid injections could be performed in the lumbar spine utilizing 2 different approaches: interlaminar and transforaminal. Interlaminar Epidural Steroid Injection (ILESI) is generally used in patients with posterior diffuse disc herniation. Transforaminal Epidural Steroid Injection (TFESI) is used in patients with neural foraminal disc herniation, lateral reses or neural foraminal stenosis, neural root indentation. In ILESE the placement of the needle in posterolateral epidural space is easy and safe but the spread of injectant to anterior epidural space may be minimal and also it could be hard in patient with severe central canal stenosis. TFESI allows selective nerve root injection and injectant spreads along the nerve and anterior epidural space. The present study aims to evaluate the effectiveness of epidural steroid injection in the treatment of lumbar radiculopathy, compare the outcomes of pain response with transforaminal and interlaminar approach. This study was approved by University's Institutional Review Board (02.12.2008, KA08210). 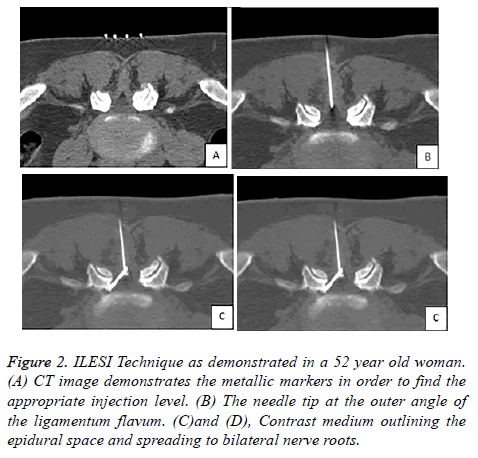 During a one year period 87 consecutive patients (17 male, and 70 female; median age 69 years; range 21-86 years) who underwent CT guided lumbar epidural steroid injections at our radiology department were enrolled in this non-randomized prospective study. The inclusion criteria were 1) presence of lumbar radicular pain with a minimum duration of 3 months 2) not responding to conservative therapy techniques 3) single level disc herniation or neural foraminal or lateral reses stenosis on recent lumbar Magnetic Resonance Imaging (MRI) or CT. Exclusion criteria were 1) contraindications for epidural steroid injection as described elsewhere  2) neurologic deficit 3) previous lumbar epidural steroid injection during the past year 4) patients with on-going workers compensation and personal injury claims. Lumbar epidural steroid injections were made by transforaminal technique in 23 patients and interlaminar technique in 64 patients. The choice as to whether to use the transforaminal or interlaminar approach was made according to the MRI or CT findings of patients in order to acquire maximum clinical response. Interlaminar approach was chosen in patients with posterior diffuse disc herniation, central canal stenosis and transforaminal approach was chosen in patients with foraminal disc herniation, foraminal stenosis, lateral reses stenosis and neural root indentation. After taking the informed consent, patients were placed on the CT (Sensation 16 detector, Siemens, Germany) table in prone position with a bolster placed under abdomen to minimize the patient discomfort. Lateral topogram and axial 3 mm thickness slices were taken from the injection level. By examinating the CT images most suitable level was selected. After marking the skin at an appropriate spot near the midline, the area was sterilized and anesthetised by 10 cc prilokain HCl. In TFESI 22-G needle (Chiba) was inserted to the safe triangle, its superior border is pedincule, lateral border is the lateral side of the corpus and medial border is nerve root. Foraminal spread of the injectant was confirmed by injection of 2 ml iodinated contrast material (20% diluted with 0.9% saline water) and CT images were obtained. After the demonstration of the contrast flow along the nerve root trace in the epidural space by CT images 80 mg triamcinolone acetate and 4 ml bupivacaine HCl mixture was injected slowly. For the ILESI 22-G Needle (Chiba) was inserted between lamina and spinous process to the safe triangle using CT guidance. The borders of the safe triangle are anteriorly dura posteriorly two laminas. The needle was slowly advanced into the epidural space by using loss of resistance technique and followed by injection of 2 ml iodinated contrast material (20% diluted with 0.9% saline water) to confirm the epidural spread. CT images were obtained to demonstrate the epidural spread of the contrast and 80 mg triamcinolone ascetate and 4 ml bupivacaine HCl mixture was injected slowly. In order to demonstrate the spread of the injectant and rule out complications CT images (Figures 1A,1B and 2A-2D) were taken and then all of the patients were kept under observation for periprocedural complications such as paraesthesia, numbness, leg weakness, vasovagal attacks, allergy until they feel comfortable. Figure 1. TFESI Technique as demonstrated in a 72 year old man with back pain. (A). 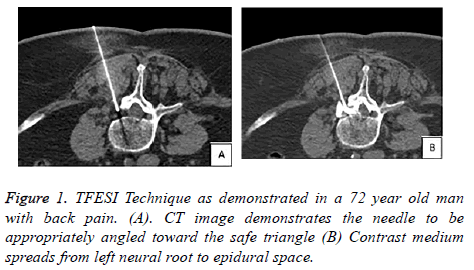 CT image demonstrates the needle to be appropriately angled toward the safe triangle (B) Contrast medium spreads from left neural root to epidural space. Figure 2. ILESI Technique as demonstrated in a 52 year old woman. (A) CT image demonstrates the metallic markers in order to find the appropriate injection level. (B) The needle tip at the outer angle of the ligamentum flavum. (C)and (D), Contrast medium outlining the epidural space and spreading to bilateral nerve roots. The outcome of patients were assessed by Visual Analogue Scale (VAS) on a horizontal 0 (no pain) to 100 (worst pain) scale immediately before the injection, at 2 weeks, 3 months and 6 months after the injection. A reduction in VAS of more than 50% after the procedure was defined as successful treatment. Second week, third month and sixth month results were considered as acute, sub-acute and chronic response to the injection respectively. Histogram and q-q plots were examined and Shapiro-Wilk’s test was performed to assess the data normality. Levene test was used to test variance homogeneity. To compare the difference between groups, either a two-sided independent samples t test or Mann-Whitney U test were applied based on the normality results for continuous variables, Pearson χ2 test or Fisher’s exact test were used for categorical variables. Analyses were conducted using R 3.2.0 (www.r-project.org) software. A p-value less than 5% was considered as statistically significant. In this prospective study 87 patients 17 male and 70 female had lumbar epidural steroid injection. Injections were made by transforaminal technique in 23 patients and interlaminar technique in 64 patients. The age of patients was between 21-86 and the median age was 69. 32 patients had story of physiotherapy, 6 patients had lumbar surgery. 10 patients had previous epidural steroid injection. There was at least a year between the previous injection and the study. The symptom duration was between 3-48 months and, mean symptom duration was 13 months. 34 patients had symptoms less than 6 months. 83 patients had lumbar MRI, 4 patients had lumbar CT. 59 patients had lumbar disc herniation (diffuse herniation, protrusion or extrusion) and 28 patients had central canal, lateral reses or neural foraminal stenosis. Most of the injections (41) were made at L4-5 level. The mean pre-procedural VAS score was 8.18 ± 0.8. Post-procedural second week, third month and sixth month mean VAS scores were 3.64 ± 2, 3.61 ± 2.2, 3.67 ± 2.2 respectively. 79.3% of patients had effective pain relief at 2 weeks follow up and 73.6% of patients had effective pain relief at 3 and 6 months follow up. The median age for the transforaminal group was 73 and the median age for the interlaminar group was 68. There was no statistically significant difference in the duration of symptoms, preprocedural VAS scores between the interlaminar and transforaminal group. In interlaminar group mean preprocedural VAS score was 8.17 ± 0.8. Post-procedural second week, third month and sixth month mean VAS scores were 3.64 ± 2. 3.61 ± 2.3, 3.65 ± 2.3 respectively. 78.1% of patients had effective pain relief at 2 weeks follow up and 73.4% of patients had effective pain relief at 3 and 6 months follow up (Table 1). Table 1. Comparative responses from VAS (Visual Analog Score) pre and post injection for both ILESI (Interlaminar Epidural Steroid Injection) and TFESI (Transforaminal Epidural Steroid Injection). In transforaminal group mean preprocedural VAS score was 8.22 ± 0.8. Post-procedural second week, third month and sixth month mean VAS scores were 3.65 ± 1.8, 3.61 ± 1.8, 3.65 ± 1.8 respectively. 82.6% of patients had effective pain relief at 2 weeks follow up and 73.9% of patients had effective pain relief at 3 and 6 months follow up. Transforaminal group showed slightly better pain relief in all terms but there was no statistically significant difference between the effectiveness of interlaminar and transforaminal group in acute (p=0.77), subacute and chronic terms (p=0.96) (Graph 1). Graph 1. 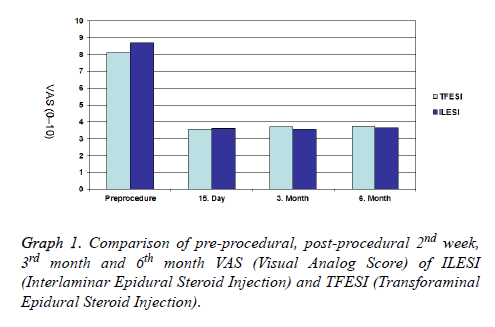 Comparison of pre-procedural, post-procedural 2nd week, 3rd month and 6th month VAS (Visual Analog Score) of ILESI (Interlaminar Epidural Steroid Injection) and TFESI (Transforaminal Epidural Steroid Injection). The mean preprocedural VAS score of patients with symptom duration less than 6 months were 8.17. Post-procedural second week, third month and sixth month mean VAS scores were 4.0, 3.97, and 4.02 respectively. 61.1% of patients had effective pain relief at 2 weeks follow up. 55.6% of patients had effective pain relief at 3 months and 6 months follow up. The mean preprocedural VAS score of patients with symptom duration more than 6 months was 8.15. Post-procedural second week, third month and sixth month mean VAS scores were 3.28, 3.28 and 3.33 respectively. 84.1% of patients had effective pain relief at 2 weeks follow up. 78.3% of patients had effective pain relief at 3 months and 6 months follow up. Patients with symptom duration more than 6 months had statistically significant higher pain relief than the patients with symptom duration less than 6 months in acute term (p=0.049) but there was no statistically significant difference between sub-acute and chronic terms(p=0.072) (Graph 2). Graph 2. 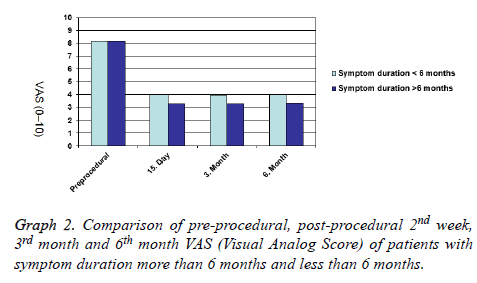 Comparison of pre-procedural, post-procedural 2nd week, 3rd month and 6th month VAS (Visual Analog Score) of patients with symptom duration more than 6 months and less than 6 months. 18 patients showed no response to injection in acute term. 23 patients showed no response to injection in sub-acute and chronic term. No major complications such as dural puncture, epidural hematoma, intrathecal, intravascular injection or allergic reactions were observed. 60 patients reported pain in the injection location and muscle weakness and numbness sensation over involved legs which recovered within a few days. Epidural steroid injection is a commonly used technique in the treatment of lumbar radiculopathy which does not respond to conservative treatments. It has been shown that, corticosteroid and local anaesthetic mixture effects by providing stabilization of cellular membranes, suppression in immune responses, inhibition of prostaglandin synthesis, increase in neuronal blood flow . In this prospective non-randomized study most of the patients had effective pain relief in acute, sub-acute and chronic terms after the epidural steroid injection. There was no significant difference in symptom duration, VAS score, age and gender between the tranforaminal and interlaminal group in the study. Karaeminogulları et al. made 46 CT guided TFESI to 42 patients and have found 95% successful outcome in 6 months follow up. In this study we found that epidural steroid injections were effective in 79.3% of patients in acute term, 73.6% of patients in sub-acute and chronic term. Smith et al. concluded that  there was no statistically significant difference in pain reduction between the interlaminar and transforaminal steroid injections. Also Candido et al. and Rados et al. compared the efficacy of TFESI and ILESI and showed no statistically significant difference between the two techniques. In this study although the transforaminal group was smaller than the interlaminar group there was slightly better pain improvement in transforaminal group than interlaminar group in acute, subacute and chronic terms but the difference was not statistically significant. The difference between the transforaminal and interlaminar groups in terms of number of patients was due to the non-randomized design of the study. Schafule et al. found out that TFESI for the treatment of lumbar disc herniation had significantly better short term pain improvement and fewer long term surgical rate than ILESI. Hung Sun Jeong et al. made TFESI using ganglionic and preganglionic approach concluded that there was no significant difference in short term therapeutic effect due to symptom duration. Lee et al. found TFESI more effective in patients with sciatica less than 6 months duration than in those with sciatica of more than 6 months duration but the difference was not statistically significant. Cansever et al. made 153 TFESI and found out that symptom duration had no significant association with short and long term post-procedural clinical status. In these study patients with symptom duration more than 6 months had statistically significant higher pain relief than the patients with symptom duration less than 6 months in acute term but there was no statistically significant difference between sub-acute and chronic terms. Our study has limitations; first the study was not randomized. We made the decision between the transforaminal and interlaminar approach according to patients MRI or CT findings in order to acquire maximum pain relief. Second follow up interval for pain relief was short. Third our patient group was not homogeneous and transforaminal group was small. In this prospective study the effectiveness of CT guided TFESI and ILESI was compared in acute, sub-acute and chronic terms; TFESI showed slightly better pain relief in all terms but the difference was not statistically significant. Patients with symptom duration more than 6 months had statistically significant higher pain relief than patients with symptom duration less than 6 months in acute term. This study confirms that epidural steroid injection is an effective treatment choice in lumbar radiculopathy. Ghai B, Bansal D, Kay JP, Vadaje KS, Wig J. Transforaminal versus parasagittal interlaminar epidural steroid injection in low back pain: a randomized, double- blind, active-control trial. Pain Physician 2014; 17: 277-290. Manchikanti L, Abdi S, Atluri S, Benyamin RM, Boswell MV, Buenaventura RM, Bryce DA, Burks PA, Caraway DL, Calodney AK, Cash KA, Christo PJ, Cohen SP, Colson J, Conn A, Cordner H, Coubarous S, Datta S, Deer TR, Diwan S, Falco FJ, Fellows B, Geffert S, Grider JS, Gupta S, Hameed H, Hameed M, Hansen H, Helm S, Janata JW, Justiz R, Kaye AD, Lee M, Manchikanti KN, McManus CD, Onyewu O, Parr AT, Patel VB, Racz GB, Sehgal N, Sharma ML, Simopoulos TT, Singh V, Smith HS, Snook LT, Swicegood JR, Vallejo R, Ward SP, Wargo BW, Zhu J, Hirsch JA. An update of comprehensive evidence-based guidelines for interventional techniques in chronic spinal pain. Part II: guidance and recommendations. Pain Physician 2013; 16: S49-283. Cansever T, Kabatas S, Civelek E, Kircelli A, Yilmaz C, Musluman M, Ofluoglu D, Caner H. Transforaminal epidural steroid injection via a preganglionic approach for the treatment of lumbar radicular pain. Turk Neurosurg 2012; 22: 183-188. Manchikanti L, Falco FJ, Pampati V, Cash KA, Benyamin RM, Hirsch JA. Cost utility analysis of caudal epidural injections in the treatment of lumbar disc herniation, axial or discogenic low back pain, central spinal stenosis, and post lumbar surgery syndrome. Pain Physician 2013; 16: E129-143. Lee JW, Kim SH, Lee IS, Choi JA, Choi JY, Hong SH, Kang HS. Therapeutic effect and outcome predictors of sciatica treated using transforaminal epidural steroid injection. AJR 2006; 187: 1427-1431. Karaeminogullari O, Sahin O, Boyvat F, Akgun RC, Gurun U, Demirors H, Tuncay IC, Tandogan RN. Transforaminal epidural steroid injection under computed tomography guidance in relieving lumbosacral radicular pain. [Article in Turkish]Acta Orthop Traumatol Turc 2005; 39: 416-420. Sicard A. Les injections medicamente uses extradurales parva ie sacro-coccygiene. Cr Soc Biol Paris 1901; 53-369. White AH, Derby R, Wyne G. Epidural injections for the diagnosis and treatment of low back pain. Spine 1986; 5: 67-86. Lievre JA, Bloch-Michel H, Attali P. Epidural hydrocortisone in the treatment of sciatica. Rev Rhum Mal Osteoartic 1955; 22: 696-697. Gupta R, Singh S, Kaur S, Singh K, Aujla K. Correlation between epidurographic contrast flow patterns and clinical effectiveness in chronic lumbar discogenic radicular pain treated with epidural steroid injections via different approaches. Korean J Pain. 2014; 27: 353-359. Huntoon MA. Anatomy of the cervical intervertebral foramina: Vulnerable arteries and ischemic neurologic injuries after transforaminal epidural injections. Pain 2005; 117: 104-111. Wagner AL. CT fluoroscopy-guided epidural injections: technique and results. AJNR Am J Neuroradiol 2004; 25: 1821-1823. Schmid G, Schmitz A, Borchardt D, Ewen K, von Rothenburg T, Koester O, Jergas M. Effective dose of CT- and fluoroscopy-guided perineural/epidural injections of the lumbar spine: a comparative study. Cardiovasc Intervent Radiol 2006; 29: 84-91.
International spine intervention society. Practice guidelines spinal diagnostic treatment procedures (1st edn) 2005. Smith CC, Booker T, Schaufele MK, Weiss P. Interlaminar versus transforaminal epidural steroid injections for the treatment of symptomatic lumbar spinal stenosis. Pain Med 2010; 11: 1511-1515. Candido KD, Raghavendra MS, Chinthagada M, Badiee S, Trepashko DW. A prospective evaluation of iodinated contrast flow patterns with fluoroscopically guided lumbar epidural steroid injections: the lateral parasagittal interlaminar epidural approach versus the transforaminal epidural approach. Anesth Analg 2008; 106: 638-644. Rados I, Sakic K, Fingler M, Kapural L. Efficacy of interlaminar vs. transforaminal epidural steroid injection for the treatment of chronic unilateral radicular pain: prospective, randomized study. Pain Med 2011; 12: 1316-1321. Schaufele MK, Hatch L, Jones W. Interlaminar versus transforaminal epidural injections for the treatment of symptomatic lumbar intervertebral disc herniations. Pain Physician 2006; 9: 361-366. Jeong HS, Lee JW, Kim SH, Myung JS, Kim JH, Kang HS. Effectiveness of transforaminal epidural steroid injection by using a preganglionic approach: a prospective randomized controlled study. Radiol 2007; 245: 584-590.